Although you were terribly shaken by the bitter sword. Saint Reginos was born towards the end of the third century at Livadia in Boetia to Christian parents. Due to his virtuous way of life he was elected to be ordained Bishop of the island of Skopelos. 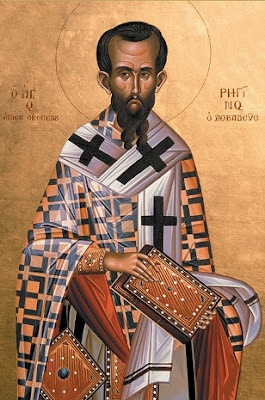 He attended the Synod of Sardica (now Sofia in Bulgaria) which met in 343, where he delivered an able refutation of Arianism and Eusebianism, which continued to rage even after the Synod in Nicaea in 325. In the year 361 a persecution broke out against the Christians under Emperor Julian the Apostate. The Prefect of Greece had Bishop Reginos and other prominent Christians arrested. The Prefect alternated between words of flattery and threats to try to persuade the Bishop to deny the Lord Jesus, thinking that by his conversion to paganism many would follow. However, all this was done in vain, for it only increased his zeal to remain steadfast in the truth. 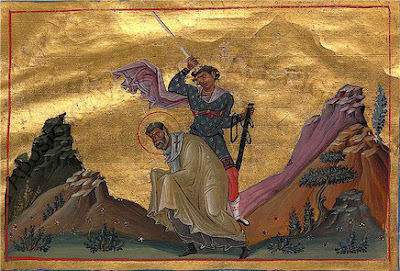 Seeing his resolve, the Prefect had Bishop Reginos beheaded on February 25, 362. Monument that marks the spot of the beheading of St. Reginos at Skopelos. The honorable relics of Saint Reginos were transferred to Cyprus and buried there. In the nineteenth century, a council of elders, presided over by Hatzi Constantinos (later Monk Kallinikos), brought a portion of the sacred relics of the Saint to Skopelos. The relics were deposited in the Monastery of Saint John the Forerunner, where they continue to be preserved. He is considered the patron of the island of Skopelos.